Jack Holder has experienced the highs and lows of speedway in recent days. 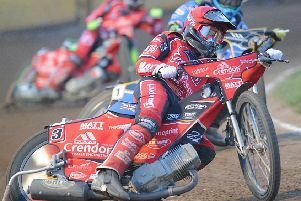 The Panthers ace staked his claim for World Under 21 Championship glory with an impressive performance to win his semi-final in Italy on May 21. But Holder was brought back down to earth with a bump – literally – last Friday night when being forced out of Panthers’ heavy loss at Edinburgh by a knee injury. The Aussie star was clattered by Monarchs man Erik Riss in heat five before being forced to withdraw from the remainder of the meeting. “I don’t like Edinburgh as it is – and I like it even less now!” said Holder. “There is hard racing and then there is stupid racing, and I was definitely on the wrong end of the stupid part at Edinburgh. “But what goes around comes around though and I’m sure myself and Erik will meet again. “I gave my knee a big whack so it was best not to take any chances with two more meetings coming up quickly on Saturday and Monday, but then they ended up being called off. “It’s been a really frustrating few days to be honest. I had to drive nearly 500 miles to and from Scotland on my own as well from home in Poole. “It was seven-and-a-half hours each way which is a hell of a long way to go for two rides and getting hurt. Holder believes he is a strong contender for a World Under 21 Championship medal in his final tilt at the title. He was pipped in a run-off for bronze by British talent Robert Lambert last year and hopes to go at least one step further this time around. And he’s not ruling out the possibility of Australian dominance with reigning champion Max Fricke and Brady Kurtz, a team-mate of Holder at Poole in the SGB Premiership, also expected to challenge for glory. “I hate the track at Terenzano,” added Holder. “I didn’t go out there expecting to win the semi, but it was a bonus that it happened. “I also felt I was in the toughest of the three semi-finals, so it was good to get through and now I can look forward to the final. The three-round final begins at Polish track Poznan on July 23. Further rounds at Gustrow, in Germany, and Pardubice, in the Czech Republic, follow in September. Holder is also away on international duty this weekend and misses Panthers’ trip to Scunthorpe in the SGB Championship KO Cup. He rides for Australia in a World Under 21 Team Cup semi-final in Pocking, Germany. They are up against the host nation, Great Britain and Russia.